Rome, Italy, August 8, 2014 (CNA)—Ursuline Sister Cristina Scuccia, the young Italian religious who won the last season of The Voice Italy, renewed her temporary vows of poverty, chastity, and obedience on July 29 at one of the congregation’s convents in Sicily. A member of the Ursuline Sisters of the Sacred Family in Milan informed CNA about the ceremony but said she could not give her name because of harassment the community has endured from Italian tabloids. In recent days a reporter from the Italian magazine Di Piu followed Sister Cristina and two others to a store near their convent located on the outskirts of Milan. “Right now, I’m tired,” she told the reporter. “The last six months have been hard. Right now my commitment is to take care of my interior life in order to be able to continue giving much to others.” The magazine published the comments along with pictures of Sister Cristina and her companions making their purchases at the store. After winning The Voice Italy, Sister Cristina plans to record an album with Universal Music, although for the moment the project is on hold. The Ursuline sister said that despite winning, her priorities would always be to continue in religious life. She plans to make her perpetual vows in 2018. 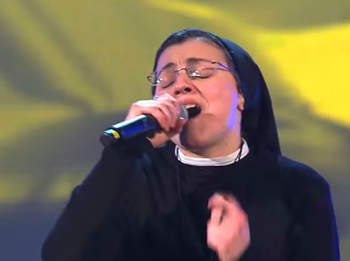 Sister Cristina caught the attention of the world in March when she sang Alicia Keys’s “No One” on the popular program. The official video of the performance has received more than 56 million views on YouTube.